Have you made any New Year’s resolutions? A common one that I’ve heard from project managers over and over again is to focus on making a great impression at work and to make this the year that they really feel as if they know what they are doing. 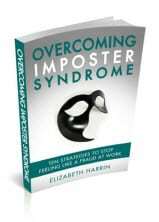 Overcoming Imposter Syndrome: Ten Strategies to Stop Feeling Like a Fraud at Work is an ebook designed for people who have ever felt as if they didn’t really know what they were doing at work – so if that sounds like you, it could be a great way to kickstart your resolutions. The book includes stories from men and women who have built their self-confidence, tackled Imposter Syndrome and found their own ways to feel more positive about their performance at work. Between all their tips and mine, you will find ideas that you can put into practice as soon as you are back to work in 2013 (if you haven’t gone back already). “I think your book is terrific. I like the practical approach, the clear format, and the useful references you intersperse.” Liz W.
“I am now 58 and retired. I wish someone had given me a book like yours about 25 years ago. I have learnt all the lessons in it the hard way. Most people starting out on a new career would benefit from reading it, both female and male.” Helen. Use my contact form to get in touch and ask for a refund. No strings attached. You don’t even have to say why you want a refund, although if you do it will help me make the book better for other people. “Very good information and certainly a guide that can be used by experienced as well as new people in any area of business.” Pat. Buy Overcoming Imposter Syndrome now!